What's going on, folks. Gir Todafunk, a.k.a. Mr. 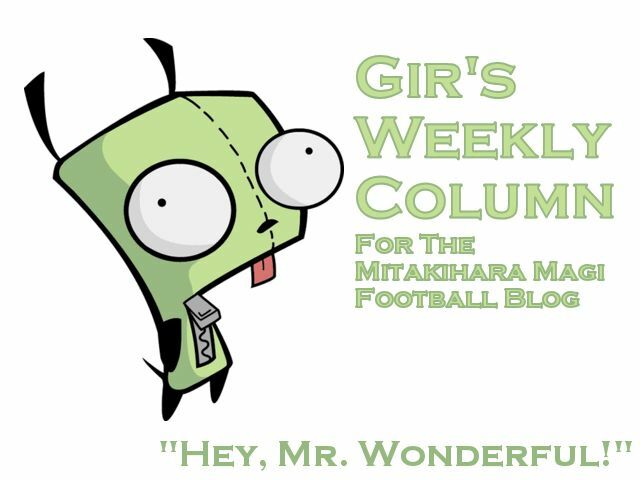 Wonderful, strikes with another Weekly Column for your wonderful readers on The Daily Magi and The Magi Football Blog. I am holding, in my hands as I type (wow, is that possible?) a magic number. It's the number 804. That is the number of passing yards Haruyuki Arita needs to pass Case Keenum and become college football's all-time leading passer. He just throw the ball normally, go over just 400 yards in the next two games and he gets it done. But since this is a road game, and Haru loves violating opponents on the road like a pimp...this could fall by the end of the month. Ohhhhhhhhhhhh my! So right now, I am making the boldest of predictions: that Haruyuki will enter the new frontier of 20,000 passing yards against San Diego State. He's going to take it easy against Fresno, I can tell you that. But once we hit that November road trip, The Pig's hitting 20K for his career. And then after that, we could be going back to catching up on our running game and you will be seeing more running plays for us. But right now, we got a record to break and a frontier to cross. Now, this could all come crashing down if Boise State's defense somehow pulls off a miracle and injures Haru for a long period of time. So, this is on our offensive line not doing anything stupid and blocking the lights out. If Haru can break the record unhurt, that's a feather in our cap because we don't have some average joe defense crashing the party irreparably. Of course, it could also be Haru's own undoing if he scrambles too much. So he has to be extra careful when it comes to these sorts of things. One thing that intrigues me about my conference is Boise State and their blue turf. The only school in this division to have blue turf is Boise State. Years ago, it was an advantage to have this type of surface. Nowadays, a lot of other schools have turf that is not green. You know what would be awesome? We have a Rose Turf Field. A rose-colored field with pink endzones and white text. I could pleasure Nana on it. Better than a bed of roses, and you can play football in it! Speaking of which, next season, Hakurei Centre will get a rose turf surface. They're getting rid of the old green FieldTurf, and going with the school colors. Hash lines are still white, but the main color is Rose. Pink end zones with white text, and a decidedly feminine charm. Oooooh, I just get naughty vibes just thinking about how our practices are going to be. We're staying at the Grove Hotel, one of the more upscale hotels in downtown Boise. We are enjoying the nice views, and right now, I am snacking on a big bucket of fries from the Boise Fry Company, replete with a variety of dips and a burger. Yes, I am that low on starch. So, with that, I wrap up my Weekly Report to you all and look forward to chatting with you next week, when dem doggies from Fresno come rolling in to M-Town. Til next time, this is Gir, Mr. Wonderful, signing off. You are not alone.